NEW TECHNOLOGY- SOCCER GOAL SET, SOCCER BALL AND MOBILE PHONE APPS FOR FUN GAMES THAT CAN BE PLAYED ANYWHERE! The Pass and Shoot Soccer Goals connects with your Phone and our Soccer Apps to provide scores, time keeping, statistics, Goal celebrations, power rankings and much more! 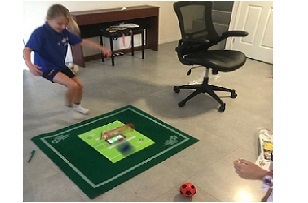 The Game Set is suitable for children and adults of all skill levels and ages and can be played in multiple ways as an active and sporty football game that is perfect for working on your football skills or playing by your self or against family and friends. 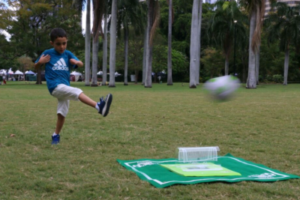 The Pass and Shoot Goal Set includes a Soccer Ball, Smart Net and Free App and is discounted for a short time to only $14.99 and includes everything to make football dreams come true. Simple purchase your Soccer Goal Game Set and download the App in the from Google Play or the App-Store and you are ready to play!